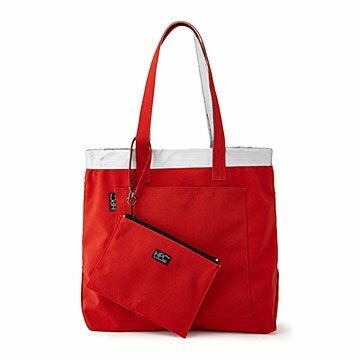 This handy tote’s lined with vinyl cut from a real billboard. No two bags are alike. Where do billboards go when they come down? Some go to landfills. (We don't like that.) Others get the trash-to-treasure treatment thanks to maker Hamilton Perkins. Each of Hamilton's spacious totes is crafted using fabric made from recycled bottles, then lined with a yard of vinyl cut from the cloth of an actual billboard. No two bags are exactly alike inside, and they're reversible, so you can show off what makes yours special. Also included? A detachable wristlet that's just the right size for small, techy stuff. If you're not sold yet, consider this: Hamilton interviewed over 1,000 people for inspiration before he even made his first bag, so you know this one's good. Made in New York.